The Consumer Price Index (CPI) rose 1.5% on a year-over-year basis in February, up from a 1.4% increase in January. Excluding gasoline, the CPI rose 2.1%, matching the gain in January. 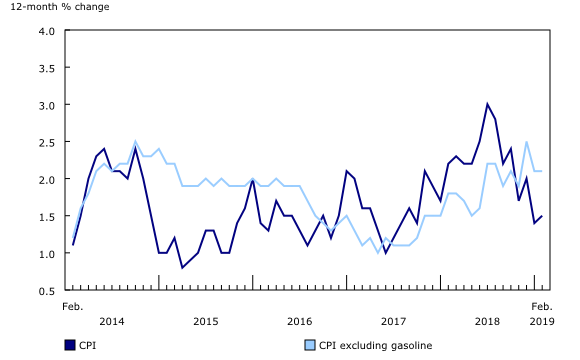 Today, Statistics Canada is launching a new interactive Consumer Price Index Data Visualization Tool that allows users to quickly identify changes and contributions to changes of the Consumer Price Index on a monthly and annual basis. 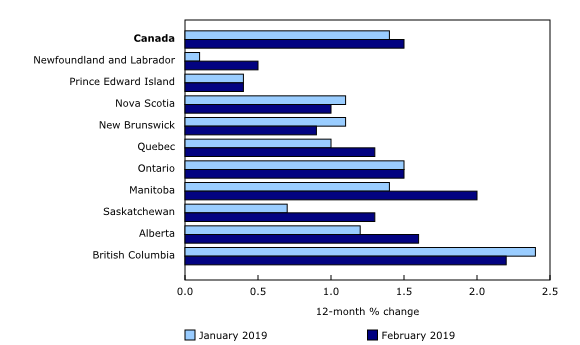 In Ontario, consumer prices for various services increased less on a year-over-year basis in February compared with January. Prices for food purchased from restaurants (+2.2%), personal care services (+1.6%), child care and housekeeping services (+1.3%) and alcoholic beverages served in licensed establishments (+2.3%) rose at a slower pace in February than in January. 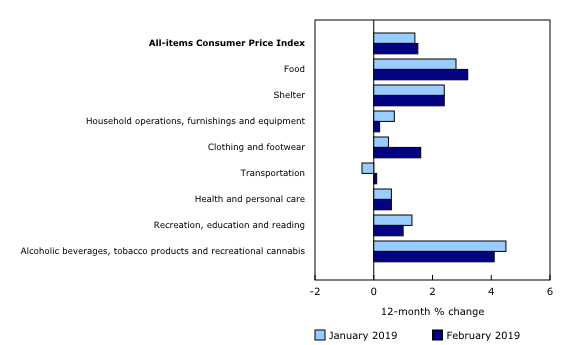 Price increases in these indexes in February 2018, which followed a legislated minimum wage increase the previous month, no longer affected the 12-month movement in February 2019. Users are reminded that the methodology for the rent index was updated with the January 2019 Consumer Price Index (CPI) as part of the regular review of CPI methodology. Interpretation of the 12-month price change indicator should be made with caution, particularly in the year following the implementation of the new methodology. Check out the new Consumer Price Index Data Visualization Tool! This dashboard provides access to current and historical CPI data in a dynamic and customizable format. Check out the latest CPI snapshot to find out what's currently driving price changes in the CPI. Explore key CPI indicators and compare price changes of all the goods and services in the CPI basket over time and by geography. This web-based application is updated monthly with the release of the CPI. Visit our new interactive Consumer Price Index Data Visualization Tool. Real-time data table 18-10-0259-01 will be updated on April 8. The CPI for March will be released on April 17. The interactive Consumer Price Index Data Visualization Tool is available on the Statistics Canada website.